Bishop Valentine of Terni is a martyred Saint of ancient Rome. Because of his believes he was executed on 14 February 269. Bishop Valentine married couples and aided Christians which Emperor Claudius II considered a crime. According to legend Valentine gave the newly wedded couples flowers from his own garden. A modern Valentine present for a friend or partner requires a personal touch, that purchased flowers can hardly provide. Cambridge. 19 Jan 2010. -- Choosing or preparing a gift for Valentine's Day should be fun - not something rushed through at the last minute. FotoInsight, a leading independent digital photo service, is expanding its range of Valentine's photo gifts year after year. "Love is a special feeling and it must be expressed in an extraordinary way, Valentine's Day is the perfect occasion", states the Catalina Martinez, Head of Communication at FotoInsight Ltd and asks: "When have you given you partner a truly unique gift?" • Snow dome with red hearts – a photograph is inserted in the centre. • Love Crystallised: FotoInsight adds to its selection of photo gifts designed to display and preserve cherished photographs. Valentine’s Day photo gift ideas include crystal photo heart with a 3D laser engraved photograph, picture frames, photo key rings, pen holder glass block with a laser engraved photograph. Special about the crystal key ring is an LED light to illuminate the engraved image. • Where Cupid’s arrow strikes there is a story to be told with a photo album or a printed hardcover Photo Book, now with passpartout layout options. With a variety of creative themes and page layouts, these one-of-a-kind photo gifts will help to remember a romantic get-away or the every-day moments shared. Photo Books in a full colour and fully editable cover start from £14.99 for 26 pages in colour (plus p&p). • The picture of a loved one in large format print? Laminated and framed posters or photo canvas prints mounted onto a wooden frame look impressive and are ready to hang on the wall. Deco block posters and photo canvases are available in different sizes from12"x8" / 20 x 30 cm (about A4) and larger. • Showing love 365 days this year. Daily reminders of love are easy with a photo calendar featuring own digital pictures. FotoInsight photographic calendars can start any month of the year. A hanging wall calendar offers room to jot down romantic dinner dates; photo calendars are easy to make and start from £7.79. • FotoInsight brings a new meaning to staying at home on Valentine’s Day: to cuddle up with the loved one and a cuddly teddy bear. Adding special effects or text to a digital photograph printed on the teddy bear’s shirt makes it a very personal Valentine’s present. • In lieu of store-bought sentiments featuring cartoon characters, own Valentine’s Day cards with FotoInsight photo Greeting Cards are another way to say “I love you!”. Photographic greeting cards can be personalised with a romantic poem or a few simple words straight from the heart. 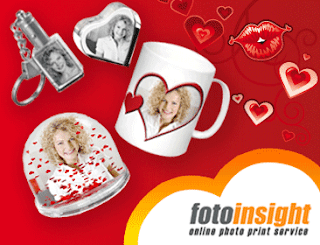 • Cups full of cheers: In time for Valentines FotoInsight adds inside colour options to Panorama Photo Mugs: http://fotoinsight.co.uk/mug The FotoInsight Designer software provides templates (for example in heart shape) to print photos onto mugs. FotoInsight offers an independent online photo service, fully flexible to be used with images from any digital camera or mobile phone and using PC, MacOS or Linux. According to FotoInsight’s management the online service offers superior quality at lower costs when compared to inkjet printing. FotoInsight offers a range of photo print products and gifts.